For centuries, spices have been used by our great grandparents till this ages where people are plain lazy to make their own spices and they head to the nearest convenience store to purchase chicken stocks, maggi stocks, fish stocks, what else. They don’t need any MSG or the so called non-MSG to add flavor in their dish because I found out that the best way to bring out the spice flavor into any dish is by pounding with mortar and pestle. 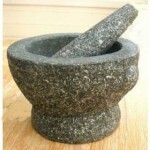 Batu Tumbuk or in English is called (Granite) Mortar and Pestle. Indestructible, will not chip or crack no matter how hard you pound. Plus it received top endorsement from celebrity chef David Rosengarten. After watching the Singaporean drama series “The Little Nyonya” i find myself attracted to their recipes and preparation of ingredients by grounding spices for better flavor. Here’s the link to Nyonya Recipe which i find in the net.